False and mistaken binaries cloud our minds far too frequently. We look at an impending dramatic transformation, such as what is happening with technology in education, and our minds often cannot help but create binary, zero-sum pairs: more technology must mean less face-to-face communication or less active, physical learning. Mentally, we cannot help but stipulate the contemporary status quo as the normal and the effective, and so create anxiety about how change will do damage, often not confronting how ineffective, and often how abnormal, the current status quo really is. These thoughts are stimulated by reading two short, excellent, paired pieces in the Chronicle of Higher Education’s special issue (November 5) on Online Learning. The two pieces, easy to overlook, near the back of the issue, deserve much more attention than they are likely to get: they set the stage and articulate the transformation that is coming brilliantly. What they do is establish that online learning, blended into our current educational models, offer incredible opportunities to fix what isn’t working today (“YouSnooze U.” and lecture learning which under-serves the struggling and bores the accelerated) but also, even more valuably, they offer opportunities to return education to its roots, whether in the 18th century or in Socratic/Aristotleian learning, of conversational, activity based learning. Every day during the academic year, tens of thousands of students across the country sit passively in 300-person lecture halls listening to 90-minute lectures on freshman or sophomore-level calculus, chemistry, or biology. Some students take notes to keep up. Most are lost or bored or both, trying their best to stay awake. Professors stare at a sea of blank faces while delivering a lecture not much different from the ones they have delivered in each of the past 10 years. Students go back to their dorms to work on problem sets in a vacuum. They fight through 1,000-page, 10-pound tomes to get at the nuggets of information they really need or can comprehend. Many give up and copy from their peers. If there were no better way, perhaps we could accept the perpetuation of this norm. But there is now, which is what is so exhilarating about our educational era. We can now deliver on-demand content to any student for nearly zero incremental cost. The video content can be paused and repeated as needed. Content producers can get real-time data on use, including student attention and efficacy. Students can focus on exactly what they need to know. They don’t have to be embarrassed to fill in remedial gaps. They don’t need to take notes. Crucially, the lectures can be given by superb communicators, with a deep, intuitive understanding of the material. Being able to directly learn from the professor actually becomes much more likely when the lecture happens on the student’s own time, with on-demand video. Then the professor is freed to be an active participant in an interactive, peer-to-peer problem-solving powwow in the classroom. The classroom will be a place for active interaction, not passive listening and daydreaming. The role of the teacher will be that of a mentor or coach as opposed to a lecturer, test writer, and grader. The institutions that will remain relevant will be those that leverage this paradigm, not fight it. Paired with Khan’s piece is a similarly excellent and invigorating piece by Dalton Conley, a NYU Dean, entitled “Steal this Education.” Conley opens with the recognition that Hoffman’s vision of forty years ago is now easier to realize than ever: students can “steal” high quality education by online viewing of things like MIT’s Open CourseWare project. It seems that higher education has finally been disintermediated. But before we play the swan song for universities… we should realize we have much more to offer than just lectures. In fact, it is our hope that we can deploy 21st century technology to reinvent the 18th century university on a global scale. But does this mean that the value of interpersonal relationships will be lost in a new “virtual academy.” No! It is the opposite. Rather than have to pay our research faculty members to stand in front of a room and teach the same classes over and over, they can now take on the role of faculty curators. They are not meant to have all the answers, but through weekly interactions– like the Oxbridge dons of yesteryear minus the sherry– they guide a handful of students through the academic wilderness. 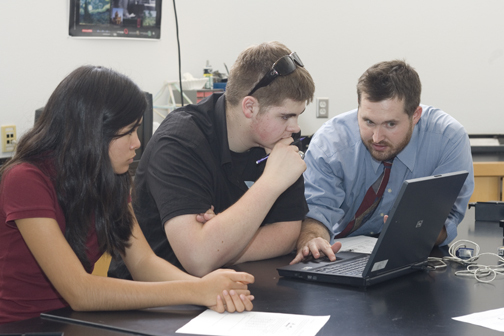 Most important, they get more interaction– face to face time in particular– with research faculty members. Khan and Conley collapse the binaries of technology’s opposition to face to face learning, and help us recognize that by going forward we are not abandoning the best of the tried and true, but rather, if we go forward in the right ways, we are instead resurrecting the best of traditional learning. Our students have much to learn, an enormous amount, but they will only do so most successfully if we blend online lesson delivery with interpersonal one-on-one mentoring and active, applied problemsolving in well-designed laboratories and studios. I agree completely that we need to blend online learning with a more studio/lab/workshop-like atmosphere in our schools. As independent schools, we owe it to our stakeholders to raise the bar offering only exceptional “lecture-based” instruction when required(in person or online) and then maximize the face time with the teachers becoming masterful educators–not unlike gardeners. I hope to be at NAIS in February. Would love to spend some time talking with you.